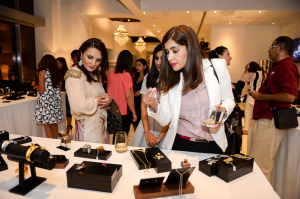 MAY 2015 – Manama, Bahrain: Artiqaz Jewelry held an exclusive launch event May 20th at The Domain Hotel & Spa to raise awareness about the brand’s introduction to Bahrain. Bahrain’s fashion industry gets even more glamorous with a new brand all the way from the United Kingdom. Artiqaz Jewelry showcased its three collections of nature-inspired, hand-crafted jewelry for sale at a 15% discounted price. 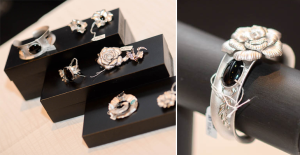 Attendees enjoyed light bites, beverages and an exceptional shopping experience as they perused through the display of unique pieces. To further highlight the beauty and intricate detail of the individual items, well-known bloggers and influencers doubled as models for the event. Each blogger chose an item from one of the collections and styled it by creating a coordinating outfit. These models added another dimension to the event and displayed the merchandise in an innovative way. Arshad’s brand is geared towards women who find their happy place in nature. The target audience is primarily young, vibrant women who use fashion to make a statement.The fashion jewelry line embodies the concept of Mother Nature, a feminine interpretation of the natural world. The line offers earrings, rings, neck pieces and bracelets incorporated into three collections: La fleur, papillon and celeste. The adornments are made from sterling silver, semi-precious stones, and fresh water pearls in 24 karat gold plating to create these one-of-a-kind pieces. Arshad is currently working on a fourth collection and utilizing bolder designs. For more information about Artiqaz Jewelry, visit http://www.artiqaz.com. Like or follow on social media @artiqaz for all the latest updates. Ithmaar Development announces the sale of Major plot on Dilmunia at Bahrain with a Sale vale of BD 8.84 million. MANAMA, BAHRAIN – 14 May, 2015 – Ithmaar Development Company announced today the sale of a strategic plot on the Dilmunia island in Bahrain to renowned Kuwaiti Developer and Hospitality Investor, Kuwait Resort Company K.S.C.P. (an affiliate of “Al Tijaria” The Commercial Real Estate Co. K.S.C.P) with a sale value of BD 8.84 million. The Preliminary Agreement signed at the final day of the Gulf Property Show by Mr. Mohammed Khalil Alsayed, Chairman of project owners Health Island B.S.C (c) and Mr. Ibrahim Al Ghanim, Deputy Chairman and CEO of Kuwait Resort Company and Board & Executive Committee Member of Al Tijaria. The seafront property will be developed to offer waterfront villas, city villas and a range of luxury apartments overlooking the Dilmunia Canal waterfalls. The development is set to include more than 300 residential offerings set in lush landscaped surroundings. The new development is the latest to join the Dilmunia family, alongside the sold out Temara and Seavilla projects developed by Ithmaar Development Company (IDC), The Treasures project by Bin Faqeeh Real Estate Investment Company and the Essence of Dilmunia by Cooperation Investment House. “The uniqueness of our conceptual identity and our delivery of progress continues to attract residents and in turn developers to Dilmunia. We are pleased to welcome the Kuwait Resort Company, and Al Tijaria Commercial Real Estate Co to Dilmunia” said Alsayed. “we’re confident that this new partnership will be a worthy addition to Dilmunia” he added. The USD1.6 billion Dilmunia at Bahrain development is a mixed-use project built on a man-made island off the coast of Muharraq. With a unique health and wellness anchor, Dilmunia will include residences, hotels, and leisure and shopping districts anchored around a health and wellness cluster. The ambitious 125-hectare man-made Dilmunia island is a project of master developer IDC, which is a wholly-owned subsidiary of Ithmaar Bank, a Bahrain-based Islamic retail bank traded on both the Bahrain Bourse and the Kuwait Stock Exchange. Ithmaar is also the Dilmunia Investment Manager. Dilmunia is located close to the Bahrain International Airport, with easy access to Saudi Arabia via the King Fahad Causeway. The name Dilmunia is inspired by Bahrain’s ancient civilization of Dilmun, which is believed to have been the inspiration for the mythical Garden of Eden. Dilmunia seeks to create a modern Garden of Eden, balancing the need for growth with the need for a healthy, sustainable ecology and leisure spaces. Pictured Right to Left: Mr. Ibrahim Al Ghanim, Deputy Chairman and CEO of Kuwait Resort Company and Board & Executive Committee Member of Al Tijaria and Mr. Mohammed Khalil Al Sayed, Chairman of Health Island B.S.C and CEO of Ithmaar Development Company. Ithmaar Bank is a publicly held company listed on the Bahrain and Kuwait Stock Exchange. Ithmaar Bank is a subsidiary of Dar Al-Maal Al-Islami Trust (DMI), and has a paid-up capital of US$757.69 million, total shareholders’ equity of US$546.34 million (as at 30 June 2014) and is listed on the Bahrain Bourse and the Kuwait Stock Exchange. Ithmaar Bank provides a diverse range of Sharia-compliant products and services that cater to the financing and investment needs of individuals and institutions. Ithmaar also maintains a presence in overseas markets through its subsidiaries, associated and affiliated companies. These include Faysal Bank Limited (Pakistan), Faisal Private Bureau (Switzerland), Bahrain-based BBK, Ithmaar Development Company Limited, Solidarity (an Islamic insurance company), Naseej and Ithraa Capital (Saudi Arabia). Kuwait Resort Company is engaged in operating Investing and renting in hotels motels clubs resorts parks, exhibitions restaurants commercial complexes and sport clubs. Also the company Purchase, sale and development of real estate and properties in or outside the state of Kuwait. Moreover the company management Property, own & trade in real estate share and bonds for its account inside and outside Kuwait. Preparing studies & offering consultations in all types of real estate solutions. Also Owning managing leasing & renting hotels health clubs. The flagship enterprise of the company is Hilton Resorts Kuwait. The Commercial Real Estate Company, K.P.S.C (Al-Tijaria) has been established since February 4th of 1968 and has been in business for over 44 years now. Al-Tijaria was listed in the Kuwait Stock Exchange (KSE ) towards the end of 2004. Al-Tijaria is considered one of the largest real estate company’s in the state of Kuwait with regards to paid up capital. Our main focus of Al-Tijaria is directed towards commercial property investment in the state of Kuwait and the Gulf regions. It is a multi -faceted organization. All financial aspects are governed by the Islamic Sharia (laws). Al-Tijaria has been awarded ISO 9001:2008 Certification. Capital Standards Rating Co. (CSR) has assigned a corporate issuer rating of ‘BBB+’ and a National rating of ‘A+kw’ to Commercial Real Estate Company K.P.S.C. (“Al-Tijaria”). The outlook for the rating is stable. Al-Tijaria’s ‘BBB+’ rating is mainly supported by the strong market position in Kuwait as one of the largest property traders and developers.